Are we about to experience a Faragemania? You can almost, almost, feel the anticipation pulsing through the Westminster bubble as the breaking news was announced on Wednesday: the BBC are to host a head-to-head debate between Nick Clegg and Nigel Farage in April on the UK’s future in Europe. This is will be an important moment in British politics. Though it remains to be seen who, if anyone will actually watch it, the debate will set the tone for the European Parliamentary elections barely a month later, which will in turn influence the narrative for the General Election next year. What impact will it have? The truth is we just don’t know. The Prime Ministerial debates in 2010 saw Nick Clegg’s personal ratings, and those of his party rocket immediately following the first debate. Come the time of the election just a few weeks later however, and the Liberal Democrats had only increased their vote share by 1 percentage point from 2005 and had in fact lost a net of 5 seats in the House of Commons. While the Liberal Democrat performance was doubtless better than it would have been without the debates, the boost diminished as Election Day approached. It can be argued though, that without the “Cleggmania” that followed the debate he would not have been in a position to negotiate for himself the job of Deputy Prime Minister. His own personal position had been elevated, he became a nationally known – and very popular – political figure. However, fastforward a few months later and Deputy Prime Minister Nick Clegg had been hammered in opinion polls having gone into Coalition with the Conservatives and (shortly afterwards) broken his promise on tuition fees. The scale and speed of his fall from popularity was perhaps exacerbated by the unnaturally high position he was enjoying post-debates. By agreeing to the debate Nick Clegg is risking Nigel Farage benefitting in the same way he once did. He is elevating the leader of a party with no MPs that achieved just over 3% of the vote at the General Election to share a prime-time stage with the Deputy Prime Minister and the leader of a Party that won 23% of the vote four years ago. Mr Farage is currently a popular, if unscrutinised, politician. In February, ComRes found that 24% of the public have a favourable opinion of UKIP, higher than the 17% that are positive about the Liberal Democrats. 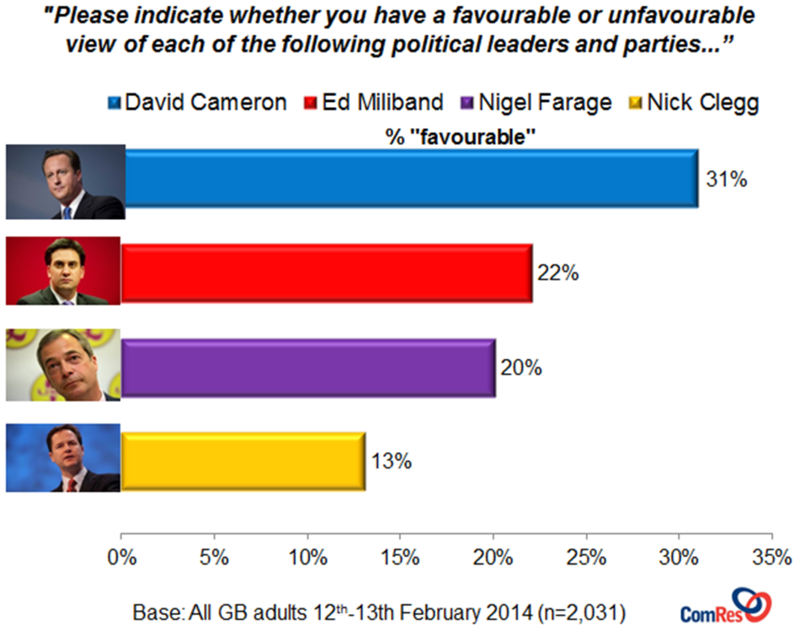 Nigel Farage meanwhile is more popular (20% have a favourable opinion of him) than Nick Clegg (13%), though David Cameron is the most popular Party leader with 31%. Clearly then Nick Clegg has little to lose in the popularity stakes: he is the least popular leader of the least popular Party. He and his team will have calculated that the Deputy Prime Minister performed well in this medium before and it may therefore give him the opportunity to restore some popularity and perhaps even credibility – his ratings could hardly get worse. Perhaps more significantly, by taking this on he is becoming the face of the pro-European movement in Britain. Nigel Farage stands with plenty to gain but also plenty to lose by agreeing to the debate. His Party is currently on 11% in the most recent ComRes poll, broadly in line with the Liberal Democrats’ 10%. UKIP are riding the crest of a wave, enjoying national levels of support that even the most optimistic UKIP supporter could not have imagined just a few years ago. While Nigel Farage is an accomplished performer in public, he hasn’t been exposed to this sort of intense scrutiny before. This will be an hour long debate on BBC primetime against an experienced live televisual opponent. The self-styled “maverick” of British politics is entering into the political establishment with this move. His customary pint and cigarette will have to be put away for the hour. Nick Clegg will believe the debate gives him the opportunity to take on the UKIP leader one-on-one, undermine his arguments and expose him as a man short on ideas and substance. Nigel Farage meanwhile will hope to continue the momentum his party is building, increasing awareness of his Party and trying to cement them in the mind of voters as a credible alternative to the status quo. If he does well in the Clegg debate, and in the European Elections a few weeks later, it will put him in a powerful position to claim a place in the 2015 leadership debates. Ultimately though, it is likely that there will be no knock-out blow, just as there wasn’t in 2010 and both men will be able to claim a victory of sorts. This outcome may in fact benefit both leaders. Mr Farage will be able to keep steam-train UKIP on track, while Clegg may re-establish his relationship with those who warmed to him in 2010. The Liberal Democrats may even be calculating – though it is a high risk strategy - that a UKIP that performs well in 2015 benefits them by hiving off Conservative votes in Tory-Lib Dem marginals. Whatever the outcome, it is an important moment as we head towards 2015, with yet another first for British politics adding to the intrigue and uncertainty. We wait to see if Faragemania is about to break out. This article was first published on the New Statesman’s Staggers blog on Friday 7th March.